In bid to fight for a slice cake of ever-growing slate tablet market, HTC has finally launched its long-awaited 7″ HTC Flyer Android-based tablet in European countries (also known as HTC Evo View in US market). With no doubt, one of its strong rivals is iPad 2 that topped the best-selling tablet lists in 2010 and continue into 2011. If you’re in consideration of choosing either one of them and would like to know more details of both, then you can view the following comparative table between HTC Flyer and iPad 2 for checking the specifications and features comparison at a quick glance. 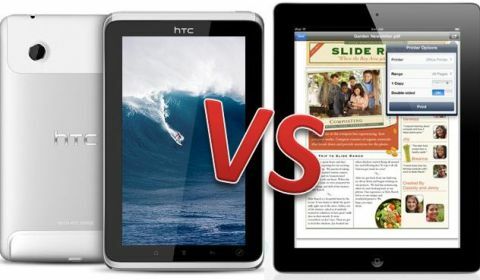 HTC Flyer is noticeably smaller than iPad 2, so actually it’s not even suitable to compare HTC Flyer and iPad 2 together. HTC Flyer is designed for folks who preferred more compact solution for easy traveling, and people who liked to enjoy better visual experience with bigger display normally will go for iPad 2. As you noticed from the table above, Apple iPad 2 adopts lower-resolution cameras and lesser RAM memory compared to the Flyer. Anyway, iPad 2 is the winner of the global tablet war thanks to its outstanding reputation of the App Store and i-series product portfolio. In my opinion, one of the most important consideration points is their price tags and subsidized mobile carrier deals in your region. The Wi-Fi only and WiFi+3G versions of HTC Flyer tablet are now available in UK, France, Germany, Italy, Spain, Greece, Portugal, Denmark, Norway, Sweden, Czech Republic, Hungary, Poland, and Romania, priced at £480/€499 and £600/€649, respectively, while iPad 2 is available in more than 30 countries as of the writing.